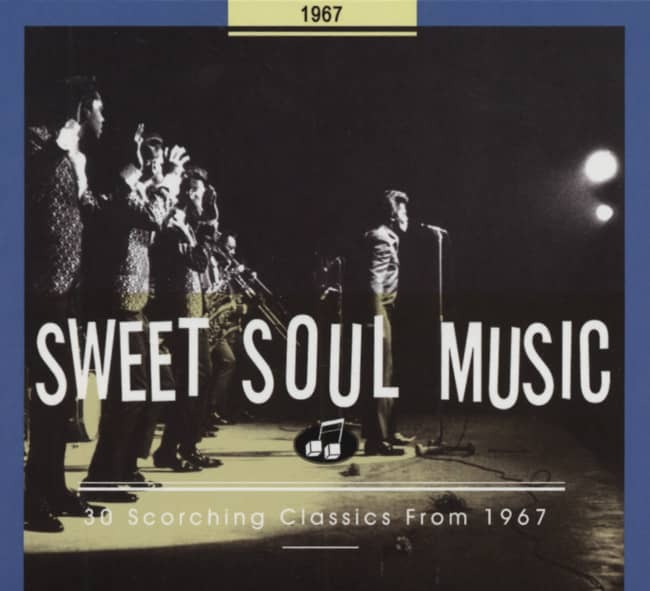 (2015/ACE) 24 tracks 1964-75 with 24 page booklet. The finest tracks from right across an illustrious soul career. The finest tracks from right across an illustrious soul career. This is the first-ever overview of Bettye Swann’s career. 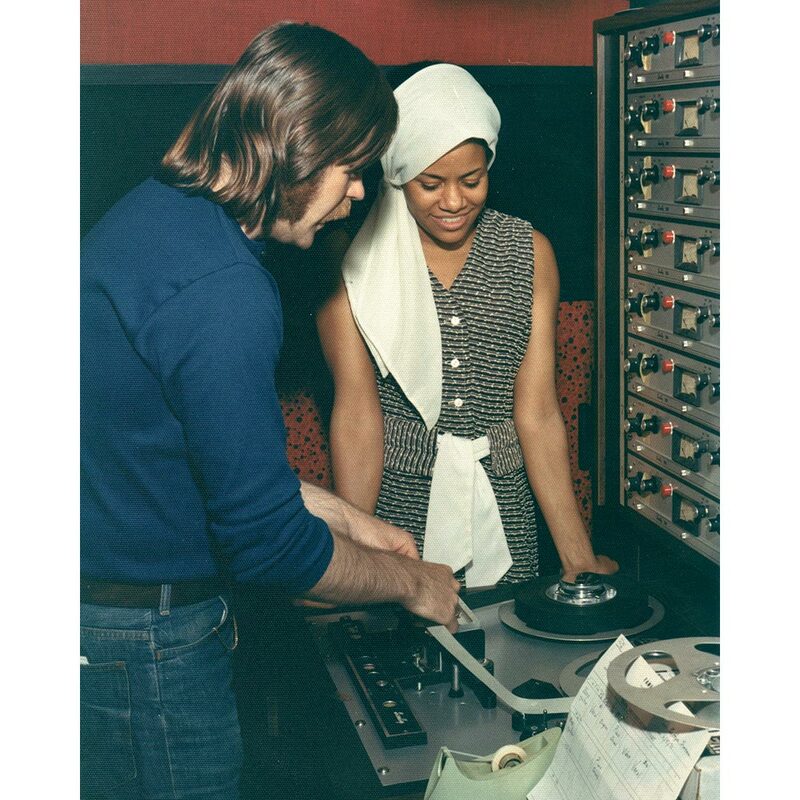 Recording with producers Arthur Wright at Money, Wayne Shuler at Capitol, Rick Hall at Fame and Tony Bell, Phil Hurtt and LeBaron Taylor atAtlanticgave Bettye’s recordings the best credentials and sympathetic productions for her beautiful voice. She had an R&B #1 with ‘Make Me Yours’, another five respectable hits and four more that made the lower reaches of the charts. 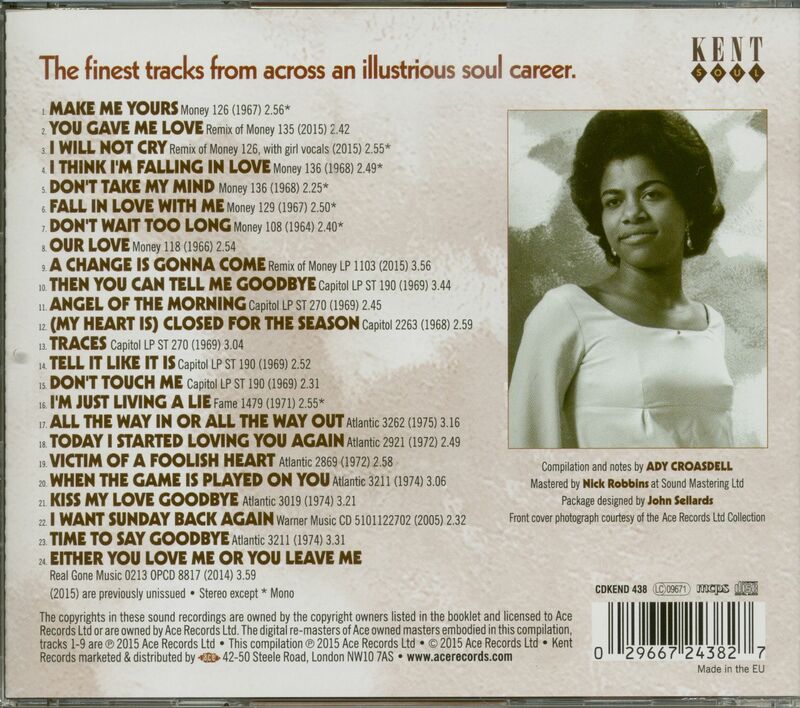 Although not particularly successful chart-wise, her 20-plus singles and three LPs, which crossed from the Motown sound via country to Philly soul, were of such high quality that she is spoken of with great respect by all soul fans. Bettye began her career as a shy teenager with a handful of self-penned songs. Recorded in her adopted home of Los Angeles, they included the upbeat ‘I Think I’m Falling In Love’ and the mid-tempo classic ‘Make Me Yours’. By her third single she was singing slower numbers and her Money LP saw her covering other artists’ ballads in her own style. A move to Capitol in 1968 produced country-influenced songs beloved of southern soul fans and ballads such as Chip Taylor’s ‘Angel Of The Morning’ and her own ‘(My Heart Is) Closed For The Season’. Fame recordings at Muscle Shoals cemented that southern link, which continued at Atlantic with George Jackson and Mickey Buckins’ ‘Victim Of A Foolish Heart’. A change of tack saw her sent to Philadelphia for up-tempo dance sides ‘Kiss My Love Goodbye’ and ‘When The Game Is Played On You’ and gorgeous ballads such as ‘Time To Say Goodbye’. Despite the brilliance of her released sides, it could be argued that Atlantic left the best number in the can – the heart-wrenching slowie ‘Either You Love Me Or You Leave Me’. Also neglected was the mid-tempo beauty ‘I Want Sunday Back Again’. Bettye largely kept her own counsel following her final 45 in 1976, which added to her mystique. Her one foray into the public eye was an appearance at the Cleethorpes soul weekender in 2013 which demonstrated what we have missed over the last four decades. Shreveport, Louisiana obviously had its charms—the Louisiana Hayride and Stan Lewis' record labels high among them—but it wasn't where Betty Jean Champion, born there on October 24, 1944, wanted to wage a musical career. After singing in high school with a group called The Fawns, she moved to Los Angeles at age 19. On her 20th birthday, she signed with Money Records, run by John Dolphin's widow Ruth and about to get hot with The Larks' Impressionistic dance number The Jerk. Not wishing her surname to be connected to boxing, she changed it to Swann, adding an extra 'e' to the end of her first name. Bettye wrote her 1965 debut hit Don't Wait Too Long, Arthur Wright serving as her producer at Money and Al Scott usually her bandleader. Swann's driving encore The Man Who Said No avoided the hit parade altogether despite a convincing performance on ABC-TV's 'Shindig!' 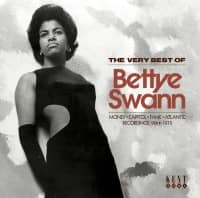 But Bettye's songwriting skills—she penned most of her Money output—restored her to the winner's circle when her delightfully breezy Make Me Yours became a number one R&B hit for two weeks and climbed to #21 pop. 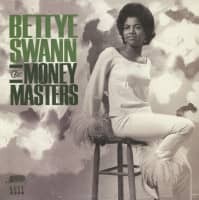 After one more hit, Fall In Love With Me, and an LP named after her smash, Swann exited Money in 1968 to go with considerably more powerful Capitol, where producer Wayne Shuler (the son of Eddie Shuler, founder of Goldband Records in Lake Charles, Louisiana) escorted the chanteuse in a country-soul direction with a '69 hit cover of Hank Cochran's Don't Touch Me. Swann moved to Rick Hall's Fame label in 1971, and her '72 hit for Atlantic, Victim Of A Foolish Heart, was done in Muscle Shoals, though she later cut Atlantic sessions in New York and Philly. 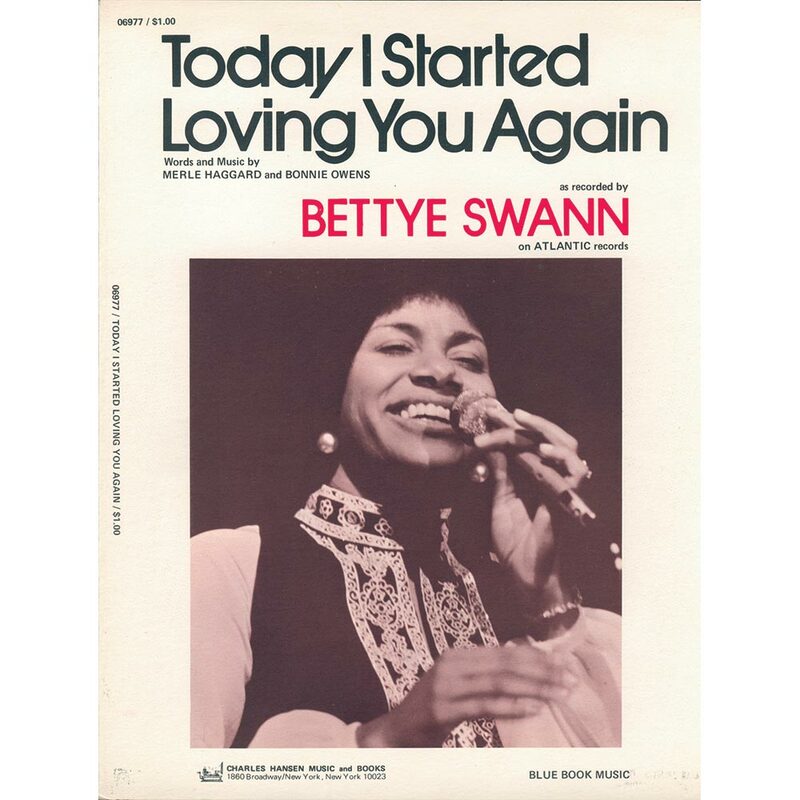 Bettye's last Atlantic single surfaced in 1976. She hasn't been musically heard from since.